Bishop Denis celebrated Mass in RTÉ Studios on Sunday 15th July. This was the first airing of Aifreann na Clainne – The Family Mass, a specially themed Mass in preparation for the World Meeting of Families 2018. 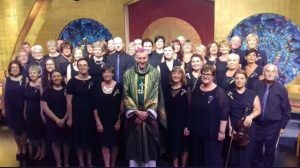 Bishop Denis was joined by a gathering of four choirs from In Cantorum, Athy, Clonaghadoo Church Choir, Clonasless Church Choir and St. Michael’s Folk Choir, Portarlington. Musical Director, Tom Conroy. Conductor, Eileen Doyle. “Take nothing for the journey” … where have we heard that message before? Tomorrow morning our Diocese travel to Lourdes, the instruction at Dublin Airport will be : not only to take nothing but remove your belt; take off your shoes and get rid of that bottle of water! It’s the 2018 problem – we surround ourselves with too much clutter, we bring too much baggage, we carry too much excess. We gather to pray on this fifteenth Sunday in Ordinary Time, thirty-seven days away from the simultaneous opening of the World Meeting of Families in every one of our dioceses. It is great to gather to celebrate what family means to us all, as we offer this new Mass, especially composed by Tom Conroy to celebrate the World Meeting. Our Mass is called Aifreann na Clainne – Mass of the Family – a Mass performed by a family of choirs. The comment “nowadays people know the price of everything but the value of nothing” has its origin in a line taken from Oscar Wilde’s ‘Lady Windermere’s Fan’. You can almost see an essay title staring up at you from an exam page! In forty-one days-time Pope Francis arrives for the World Meeting of Families. On the first day that the tickets went online, those for Knock were completely gone in just over four hours! By midnight of that first day that tickets became available nearly 354,000 had booked tickets for the Mass in the Phoenix Park. At this stage all tickets for the Phoenix Park have been booked. This World Meeting here in Dublin, before it ever starts has already exceeded all records. There is no cost, but deep value to the tickets associated with the Knock event and the Phoenix Park Mass. The price of everything, the value of nothing! Take nothing with you for the journey Jesus instructs his disciples – nothing suggests the disciples would become dependent on the goodwill and generosity of others, not the empty suitcase synonymous with a pre-Christmas or New Year shopping spree in New York! The disciples were invited to bring nothing! Think of that for a moment … nothing, allow ourselves to become totally dependent on those around us … no mobile, no hairbrush, no bottle of water, no wifi – take nothing, depend totally on providence, put yourself completely in God’s hands. It’s the middle of the Ordination Season and while a priestly ordination no longer might make front-page news, it remains a significant milestone in a young man’s life and in the local parish’s story. Our first reading this Sunday morning from the prophet Amos brings me back to the celebration of my own First Mass thirty years ago. I chose then the call of Amos so vividly described “I was a shepherd and looked after sycamores: but it was the Lord who took me from herding the flock”. Like Amos, often the journey we set out on is not always of our own choosing. It brings us to different places, different people, different experiences, because it’s following God’s call, not our own; it is hearing His voice, not our own. Aifreann na Clainne is exactly what it says on the tin, a Mass to celebrate family, a Mass composed by Tom Conroy, conducted by Eileen Doyle, sung today by a family of choirs, a Mass to welcome Pope Francis and our visiting delegations in just over a month’s time. Mark seems to saying to us in this morning’s text “if you enter a house anywhere, stay there until you leave the district”. He is asking us in our vocation call, to be present, to be as we said at the school roll call in every class all those years back – Anseo rather than As Lathair! Imagine if all who come to the World Meeting, all who attend the Papal events around that meeting were truly present to our church, to our faith communities what a vibrant Sunday celebration we would have in every parish. I pray that you as family, as chlann, as pobal will be truly present for the World Meeting and that you as parish will be enlivened by what you experience. Alongside our ticket may we all be truly present. Amen.